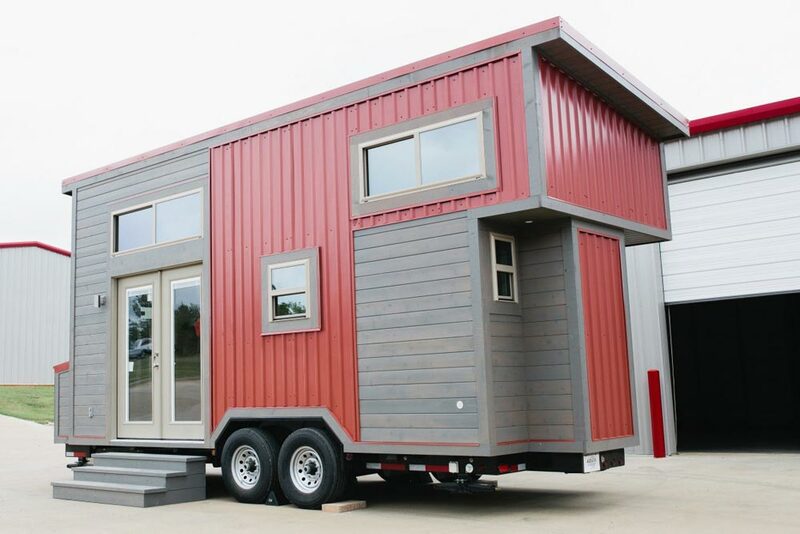 Houston a 20-foot energy efficient tiny house built by American Tiny House. The tiny house has a mix of grey siding and red corrugated metal for its exterior. A 2-foot cantilever and bump-out provide more space in the loft area and bathroom. A large storage compartment sits over the tongue of the house and there are full light double french doors. Inside the tiny house are two lofts: a storage loft over the kitchen and the bedroom loft over the bathroom. The kitchen includes a freestanding gas range with hood, refrigerator, and stainless steel sink. In the bathroom is a shower, vanity, and composting toilet. The price for Houston starts at $52,400. For more information about this tiny house you can visit American Tiny House. More tiny houses from American Tiny House: Golden, Everett.